Leaves are gathered during the clean up. RESIDENTS across Frome came out in force on Saturday 9th November to participate in the Great Frome Clean Up. 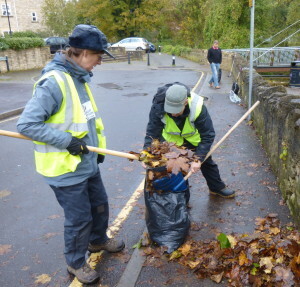 The event organised by Dorothy-Ann Bryant as part of Participate Frome week, saw groups of local people meet in seven different places around the town to clean up the streets. As a result of the clean-up in the town centre businesses including National Westminster Bank, Fat Face and Superdrug have pledged their on-going support to keep the areas outside their shops clean and tidy with monthly clean ups to keep on top of the weeds. Next up Keep Frome Clean is calling on residents across Frome to keep their own streets clean with regular ‘clean ups’. Cllr Peter Macfadyen said, “As residents of Nunney Road, the town clerk and I will lead the way. There will be a Big Street Clean Up on Sunday 24th November. I invite every household on the street to come out on the day at 10.00am and tidy up outside their house, sweeping leaves, picking up litter and having a general clean up. It’ll be fun. Which street will be next?